Heat stroke is also known as sunstroke. It is a heat related illness where body temperature rises to 104F or higher. It is often accompanied by dehydration. 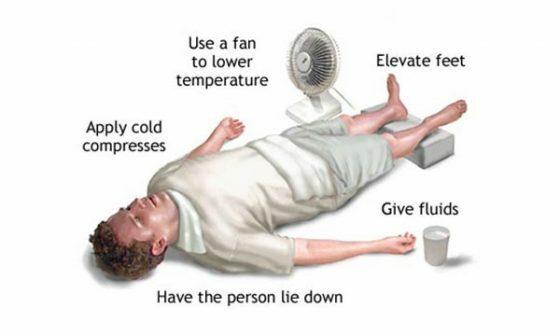 Heat stroke is a medical emergency and requires immediate treatment. It can damage our brain and internal organs. It usually occurs due to prolonged exposure to high temperatures. Elevated body temperature, 104F or higher. Confusion, delirium, irritability, confusion, slurred speech. Increased pulse and heart rate. Heat generated by our body metabolism is dissipated via radiation and by evaporation of sweat. In extreme temperatures and extreme physical exertion in hot, humid climates body is unable to dissipate heat. This results in an abnormal increase in body temperature. 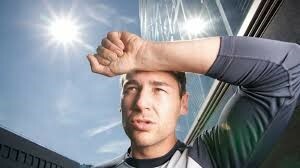 When the body temperature reaches 104F or higher it is called heat stroke. External heat stroke- Caused due to overexertion in hot humid climate. Non -external heat stroke- Caused due to extreme hot climate. Infants and children especially left in a parked car. Elderly especially living in a house that lacks proper air flow. People who exert themselves physically under the sun. Drinking very less amount of water. Drinking an excessive amount of alcohol. Wearing tight clothes that prevent sweat from evaporating. Chronic illness such as lung and heart diseases. Diagnosis of heat stroke is done by observing signs and symptoms of the person who has been exposed to high temperatures. Immediately call for a medical emergency if you suspect someone to experience heat stroke. Take the following actions immediately till emergency services arrive. – Immerse the person in a tub of cool water or make him/her take a cool shower. – Remove tight and excess clothes from his body. – Sponge the person with cool water or spray cold water on the person’s body. – Place ice packs on the victims head, armpits, groins. You may also use cold and wet towels for this purpose. – Make the person lie under the shade or if possible, bring him indoor and turn on the air conditioners. – Fan the patient to enhance sweating. Prevent dehydration by giving the victim cool water and other caffeine and alcohol-free drinks. But if the person is not alert or is vomiting do not give him anything to drink. Monitor the patient’s body temperature. In case the person is vomiting, turn him on their side to avoid choking. In the case of seizures, try to keep the victim safe from injuring. Avoid vigorous physical activities under the sun especially in extremely Hot, humid climate. Drink plenty of water and fluids. Avoid caffeinated drinks and alcohol. Never leave your infants and kids in locked and unattended cars. Walk in shades, carry an umbrella or wear a hat. Avoid wearing tight fitted clothes.